Hardy, sun-loving palms make a striking, tropical inspired addition to yards and landscaping. A crown of gray-green fronds strongly recurved, create a graceful cascading effect for this feather palm. The stocky trunk becomes patterned with the stubs of old leaf bases. Females bear large clusters of edible fruits with a pineapple-like flavor. 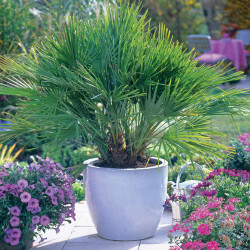 Pindo Palm is excellent as a low, bushy specimen for containers, tubs or gardens. It is attractive when interplanted among tall, slender palms. LIGHTING REQUIREMENTS Climate Zone: 4, 5 CARE INSTRUCTIONS Foliage: Evergreen Height: 10'-20' Light Exposure: Part shade, full or reflected sun Spread: 5'-15' Water Use: Medium to high Growth Rate: Slow Trunk Width: 1 - 2' Cultural Requirements: Old fronds need to be cut evenly to avoid a ragged appearance. Deep, infrequent irrigation is best. Problems: Iron chlorosis can occur on alkaline and poorly drained soils. Susceptibility is shown to bud rot and root knot nematodes. 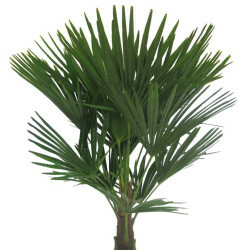 This tall, graceful palm displays a luxurious head of arching 10 to 15 foot fronds. Prominent rings develop on the smooth gray, upright trunk. The bright-green, feathery leaves form long, papery filaments with exposure to wind and temperature extremes. The Queen Palm creates a lush, tropical effect for pools, home gardens or courtyards of large buildings. It makes a showy appearance both as a single specimen or clumped in groups. LIGHTING REQUIREMENTS Climate Zone: 4, 5 CARE INSTRUCTIONS Foliage: Evergreen Height: 30'-40' Light Exposure: Part shade to full sun Spread: 15'-30' Water Use: Medium to high Growth Rate: Moderate to fast Trunk Width: 1.5–2' Cultural Requirements: This palm responds well to nitrogen fertilizer, extra iron and ample water. Planting in protected areas helps to reduce wind damage. Problems: Sensitivity to cold generally limits use to below 2500 feet in elevation. Fronds may develop iron chlorosis or Manganese deficiency. Susceptibility is shown to spider mites, root knot nematodes, and bud rot. Possible damage in high winds. 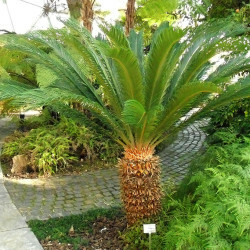 This small, compact plant is not a true palm, but a cycad. The shiny, dark-green foliage consists of numerous feathery leaves arranged in a flat spiral at the top of the heavy black trunk. The plant is slow-growing, producing new leaves only once a year. The Sago Palm makes an excellent tub or planter subject. It is effective when combined with other tropical and subtropical plants. 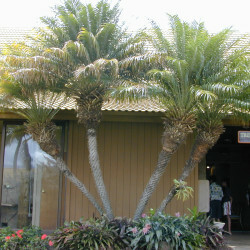 Small Sago Palms are sometimes used under tall trees in place of ferns. LIGHTING REQUIREMENTS Climate Zone: 4, 5 CARE INSTRUCTIONS Foliage: Evergreen Height: 6'-10' Light Exposure: Part to full shade Spread: 3'-5' Water Use: Medium to high Growth Rate: Slow Trunk: clumping or single to 1' width Cultural Requirements: Good quality garden soil and regular irrigation encourage best growth and appearance. In zone 5, select a shady planting site. Problems: Plants may sunburn with full to reflected sun and heat, especially when grown as container plants. 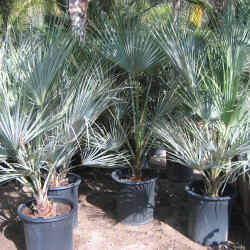 Canary Island Date Palm is a large, wide-spreading feather palm of majestic proportions. The glistening, dark green leaves with orange midribs are long and arching, giving the crown a distinct fountain-like outline and form. The trunk of young trees is pineapple-shaped becoming columnar at maturity. Female trees produce clusters of orange-yellow fruit in the fall. Most effectively used along avenues, in parks and large commercial and residential landscapes. Young trees make attractive and undemanding container subjects. LIGHTING REQUIREMENTS Climate Zone: 4, 5 CARE INSTRUCTIONS Foliage: Evergreen Height: 40'-50' Light Exposure: Part shade, full or reflected sun Spread: 20'-40' Water Use: Medium to high Growth Rate: Slow Trunk Width: 3'-4' Cultural Requirements: Deep, regular irrigation and fertilization encourages faster growth. Periodic pruning and grooming are necessary for best appearance. Problems: Fruit is messy and attractive to birds. Pruning maintenance can be costly. Dry rot is sometimes an unsightly problem on frond stubs and trunk. This palm recovers slowly from frost damage. Susceptible to rootknot nematodes, bud rot, and palm borers. May develop magnesium deficiency. 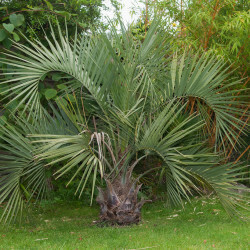 Windmill Palm is small, slow-growing and tolerant of both heat and cold. Fan-shaped leaves are displayed in a windmill-like fashion in a compact, regular head. The slender, upright trunk tapers inversely from top to bottom. Stubs of old fronds protrude from a shaggy covering of hairy, black fibers. This semi-dwarf compact species is effective for tropical plantings, atriums and containers. It makes artistic pairs for an entryway, along a narrow walk or drive. LIGHTING REQUIREMENTSClimate Zone: 4, 5 CARE INSTRUCTIONS Foliage: Evergreen Climate Zone: 4, 5 Height: 15'-25' Light Exposure: Part shade to full sun Spread: 6'-8' Water Use: Medium to high Growth Rate: Slow Trunk Width: 1' Cultural Requirements: Responds well to regular irrigation and fertilizer. Appearance is best when grown in the shelter of taller trees or on the east side of structures where the tree is shaded from afternoon sun. Occasional pruning is necessary for a neat appearance. Problems: Fronds may become tattered in high winds and tip-burn with reflected sun and heat. 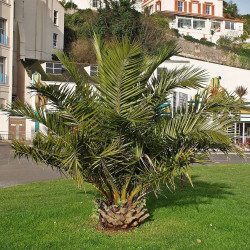 Bismarck palm trees are one of the most widely used palms for landscaping. Their color and overall beauty play a role in this distinction, as does their ability to withstand colder, and even below freezing temperatures. They are highly sought after for their beauty and versatility. They are used for centerpieces and for lining streets and driveways. They come in two basic colors, bright green and a dusty steel blue- some also call it silver. LIGHTING REQUIREMENTS USDA hardiness zones: 9 through 11 CARE INSTRUCTIONSFoliage: Evergreen Height: 40'-50' Light Exposure: Part shade to full sun Spread: 15'-20' Water Use: Medium to high Growth Rate: Moderate to fast Trunk Width: 4'-5' Cultural Requirements: Some drought tolerance is shown but prefers regular, infrequent, deep irrigation. Good soil drainage is important. Periodic grooming improves appearance. Fertilize annually in spring or summer. Problems: Thatch may harbor pests and be a fire hazard. Yearly trimming can be costly. Susceptible to bud rot and root knot nematodes. A rough textured slender trunk and feathery, widespreading canopy characterize the Date Palm. The gray-green head of leaves is ascending in the center and downcurving towards the outside, giving a stiff formal appearance. Offshoots may appear at ground level or on the trunk. Trees are male or female, and both sexes must be planted to ensure fruit production. In some areas, pollen can be obtained commercially to fertilize a single female tree. In urban landscapes this palm makes a dramatic specimen tree. It is also planted in rows along roadways and drives. The Date Palm blends well with desert growth to give a feeling of a desert oasis. Its slender trunk makes this species more graceful for some landscape uses than Canary Island Date Palm. LIGHTING REQUIREMENTS Climate Zone: 4, 5 CARE INSTRUCTIONS Foliage: Evergreen Height: 50'-60' Light Exposure: Part shade to full sun Spread: 25'-35' Water Use: Low, medium or high Growth Rate: Slow Trunk Width: 2'-2.5' Cultural Requirements: To develop a single trunk or maintain a neat appearance, offshoots need to be removed or limited to a few in number. Transplanting is best in summer. Regular irrigation and fertilizer encourages best growth. Problems: Old fronds and fruit drop require considerable cleanup. Too messy for pool/patio use. Susceptible to bud rot, palm borer, and nematodes. Pruning may be costly when the palm is tall. 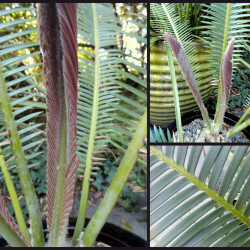 This slow-growing cycad develops a rosette of leaves from a short, cylindrical unbranched stem. The young Dioon has an airy, lacy fern-like quality. 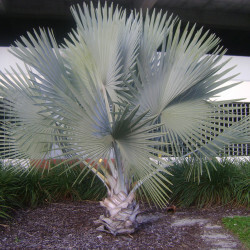 As plants mature, the leaves become rigid and silvery grey, reminiscent of palm foliage. Dioon is rich and exotic in character. It is excellent as a container plant or for enclosed or partly enclosed garden areas with a tropical theme. LIGHTING REQUIREMENTS Climate Zone: 4, 5 CARE INSTRUCTIONS Foliage: Evergreen Height: To 5' Light Exposure: Part to full shade Spread: 3'-5' Water Use: Medium to high Growth Rate: Slow Trunk Width: 1' Cultural Requirements: Well-drained, fertile, organic soil and protection from hottest sun and wind should be provided for best growth. Problems: Plants may sunburn with full or relected sun, especially when grown as container plants. This slow grower is one of the most cold-hardy of all palms. The distinctive fan-shaped fronds are composed of stiff, blue-green to gray-green leaflets. These eventually form a compact head at the end of each curved stem. In Arizona, the bushy, multi-trunked type is the most commonly used form of this highly variable species. The suckering habit eventually results in pleasing stem groupings and much landscape interest. 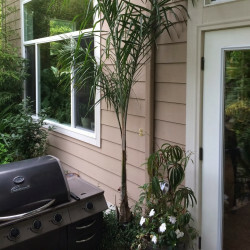 This small palm makes a striking accent plant against architectural features. It is one of the best species for containers as well as for massing at the base of taller growing palms. LIGHTING REQUIREMENTS Climate Zone: 4, 5 CARE INSTRUCTIONSFoliage: Evergreen Height: 5'-15' Light Exposure: Part shade to full sun Spread: 5'-20' Water Use: Low, medium or high Growth Rate: Slow Trunk Width: clumping Cultural Requirements: Mediterranean Fan Palm survives much neglect but grows best in rich soil with ample water. Some pruning may be necessary to limit the number of stems and to remove old fronds. Problems: None recorded in Arizona. Waxy, silvery-blue leaves arch gracefully from the erect columnar trunk of this striking palm. Faintly fragrant, creamy white flowers are arrayed on flower stalks 18 feet or more in length. Some consider it better appearing in youth since mature specimens develop a stockier trunk and the foliage has a less pronounced blue color. 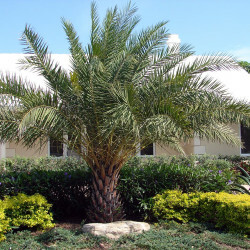 This beautiful tree offers much versatility as a landscape palm or as a container subject. The attractive blue foliage makes a nice contrast with desert vegetation. LIGHTING REQUIREMENTS Climate Zone: 4, 5 CARE INSTRUCTIONS Foliage: Evergreen Height: 25'-30' Light Exposure: Part shade, full or reflected sun Spread: 6'-10' Water Use: Low to medium Growth Rate: Slow Trunk Width: 3'+ Cultural Requirements: Mexican Blue Palm tolerates extremes of heat, cold, wind and a wide range of growing conditions. Regular, widely spaced irrigation is best. Problems: None reported.